Ready for pickup at 100 Bonner Street between 9am and 6pm M-F.
We will be tracking all signs so we can pick them up later. Signs will ONLY be placed in yards, with approval of property owners in full compliance with local law. If you’ve already signed up- it will be delivered by Saturday. Thanks to all my supporters who’ve made these signs possible. 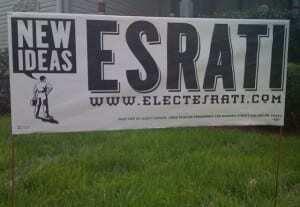 If you are ready for new ideas in Dayton, if you are ready for change, David Esrati is your only choice for the Dayton City Commission. Thanks for the update- we’ll have to get out and fix it. Of course I got permission. The lot belongs to Don Boeke, “The Egyptian” which is one of the finest classic auto restorers in the country. Don is a former Navy diver- and he lives right on the premises. Cybertecnics is a recording studio in the front part of his building. Odd juxtaposition- a recording studio that needs sound isolation next to a auto repair shop where people hammer on cars all day.